As we've discussed several times in the past, it would be foolish to expect every (if any) movie to blow you away with a completely original idea. Most movies are variations on a core set of themes and characters, many of which were established centuries ago in the early days of literature. (To be fair, we do occasionally see new concepts in movies, but let's put that aside for the moment.) Often the most for which we can hope is for a movie to put a novel spin on an old chestnut. This can certainly give a film a chance to shine, and we do get a lot of shine in Crazy Rich Asians, a movie which takes a tired premise and places it on a world tour. Rachel Chu (Constance Wu) is very happy with her life in New York City. She's an economics professor at NYU and she's dating the hunky Nick Young (Henry Golding). When Nick informs her that he's been invited to a wedding in his native Singapore, Rachel is excited at the opportunity to travel with her beau. But, when they reach the airport and are whisked off to First Class, Rachel begins to realize that she doesn't know much about Nick's family. You see, he's rich...crazy rich. Arriving in Singapore, Rachel visits the enormous mansion in which Nick was raised and meets his mother, Eleanor (Michelle Yeoh), and immediately feels a cold shoulder. She almost meets Nick's extended family and his old friends, and learns that he comes from a completely different world. Leaning on her college friend, Peik Lin Goh (Awkwafina), Rachel must find the strength to face Nick's family and prove that she is worthy of his love. Crazy Rich Asians is based on the first in a series of novels by Kevin Kwan and the film became a monster hit at the U.S. box office, earning back over five times its original budget. 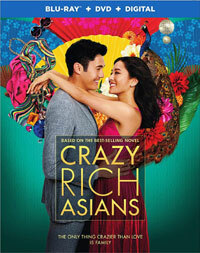 The movie was hailed by critics and audiences alike for being a Hollywood movie with an all-Asian, and, given the need for more honest diversity in films, it deserved that praise. But, anyone who called the film brave should take pause, as the presence of new faces does not mean that anything truly new is happening here. In other words, Crazy Rich Asians taking a new stab at some very old concepts. The movie takes us into the world of the ultra-rich in the same way that television audiences were transported by shows like Dallas and Dynasty did in the 80s. We see not only the cars, houses, and other trappings of wealth, but the sort of apathy and sense-of-entitlement displayed by these characters. The motivating plot here -- the old, "Oh, I didn't mention that I'm rich?" idea -- has been done many times over in the past, and it allows us to discover the world of well-off through the eyes of the main character. But, as implied above, just because Crazy Rich Asians isn't doing something new, doesn't mean that it's not doing it well. (Was that a triple negative?) The movie makes some very smart choices which allow it to win over the viewer. First of all, the main characters are likeable. Rachel and Nick come across as solid, good people that helps draw us into the movie. Again, Rachel is a college professor, someone who is successful in her field, so the fact that she's floored by Nick's world adds weight to the story. Many of the people in Nick's world are vapid or cruel, but some of them are nice and even vulnerable, and, again, this keeps the film from being an over-the-top caricature. Director John M. Chu, who has a diverse resume, does a great job of capturing this world, as he uses a very bright color palette, and let's the massive scale of things speak for itself. The one misstep which Crazy Rich Asians makes is that it assumes that the viewers knows what or where Singapore is. (It's a sovereign city-state and country located at the tip of the Malaysian peninsula.) Other than that, prepare yourself for a movie which will not win you over with its story, but allows its characters and unique setting woo you. The leads do well, and the cast contains some familiar faces. While this is ostensibly a romantic-drama, there are some truly funny moments here, and the comedic actors involved steal the show. Like a variation on a familiar recipe, Crazy Rich Asians adds a dash of something new to something familiar and comes out with a winning combination. Crazy Rich Asians shows that you should Google your boyfriend on Blu-ray Disc courtesy of Warner Bros. Home Entertainment. The film has been letterboxed at 2.35:1 and the Disc contains an AVC 1080p HD transfer which runs at an average of 32 Mbps. The image is very sharp and clear, showing no overt grain and no defects from the source materials. The colors really stand out here, as the movie features bold and bright colors. The image is never overly dark or bright. The level of detail is notable and we are treated with a crisp picture which has a nice amount of depth. The Disc carries a DTS-HD Master Audio 5.1 track which runs at 48 kHz and an average of 3.5 Mbps. The track provides clear dialogue and sound effects. There are several party sequences here which deliver impressive surround sound, as the noises from the crowd can be heard from the front and rear channels. The music in these scenes delivers impressive subwoofer effects. The stereo effects highlight sounds coming from off-screen. The Crazy Rich Asians Blu-ray Disc contains a few extras. We begin with an AUDIO COMMENTARY from Director John M. Chu and Novelist Kevin Kwan. "Crazy Rich Fun" (7 minutes) is a making-of featurette which provides a broad overview of the film. It features comments from the cast and the creative team, including novelist Kevin Kwan, as well as some on-set footage. We get seven DELETED SCENES which run about 12 minutes. There aren't any new characters or subplots here. The final extra is a 2-minute GAG REEL.